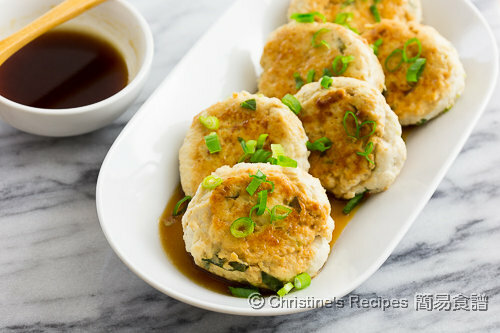 These Teriyaki chicken patties are so moist and tender. It can be served as a light meal, sided with some vegetables or snack. I wouldn’t have known how nice the taste of tofu and chicken with teriyaki sauce going so well if I hadn’t run the experiment. All of three components are blended nicely and tightly in this dish. 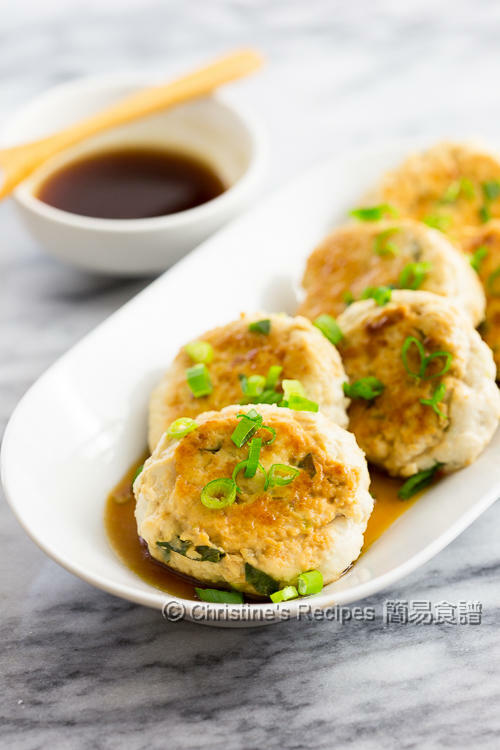 The key ingredient to make these chicken patties tremendously moist and tender is the humble tofu, a healthy food that I often use in my cooking. I didn’t need to add any fat into the meat in order to make it not tough after being cooked. Just let the tofu do the magic. I always reckon teriyaki sauce is so versatile and can turn any ordinary dish into a very special one. Simply boil some greens to go with these chicken patties, you’ll have a balanced light meal. Cut the chicken into chunks. Blitz it in a food processor into a paste. (Note: If not using a food processor, you can finely chop the chicken meat with a cleaver. 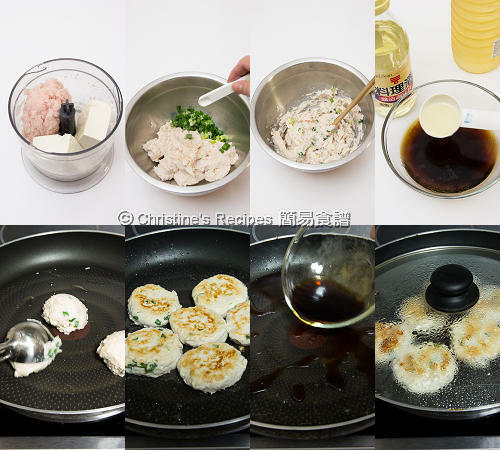 My mum used to make meat patties in this way.) Add tofu and combine well. Transfer the chicken and tofu into a large mixing bowl. Mix in the marinade and spring onion. Set aside for 15 minutes. Mix all the ingredients of the sauce. Set aside. Heat oil in a frying pan over medium heat. Damp your clean hands, or a large spoon, or an ice-cream scoop to divide the mixture into 6 to 8 round discs. Put them into the frying pan with a bit of heated oil. Cook them until both sides are lightly brown. Pour in the sauce. Cover and cook for 2 minutes, until the sauce is reduced by half. Done. Serve hot. Try to get firm tofu as it contains less water. You don’t want too much water released from the patties while pan-frying otherwise. The power of every stove is very different. Please adjust the cooking time while cooking the sauce. The sauce is easily burnt as it contains some sugar. Japanese cooking sake is available at Asian grocers or supermarkets. Packed with lean protein and so delicious too! Hi Christine, can we cook these patties on the BBQ instead? Would this change the flavour of the patties or make it dry? If so how long? Yeah, I'm afraid these patties would be quite easily dried up on BBQ fire. Hi, if I buy ready made teriyaki sauce, how many spoon to use? About 4 to 5 tablespoons depending how many sauce you like. This sounds so delicious! I love teriyaki and this is a brilliantly healthy way to eat it! Can you use already ground chicken from the store? For convenience, you can ground chicken from supermarkets. It works too. can i use minced chicken meat instead? Your sauce refers to teriyaki sauce? For convenience, you can use minced chicken meat for sure. Yes, mix all the ingredients of the sauce yielded in this recipe. It's teriyaki sauce.